Marc Jacobs Daisy Eau So Fresh is a very special fragrance for me – it reminds me of when I started one of my most memorable jobs (the one I had before I left to work for myself) and early on I remember testing this fragrance (the original) and absolutely falling head over heels for it. I remember spraying it on and then being stopped TWICE when out on my lunch break by people asking what it was. That never happens – but it was one I loved immediately and also one of only two perfumes I have actually used a whole bottle of (the other was CK One when I was a teenager and it was THE fragrance to wear). But this is a little review of the Marc Jacobs Daisy Eau So Fresh Twinkle edition. So whilst there’s been a few variants of limited edition variants of the Daisy family – as with this one they often do versions across the whole Daisy family. Including Daisy and Daisy Dream. But for this I want to just focus on my favourite, the Daisy Eau So Fresh perfume. This is the Marc Jacobs Daisy Eau So Fresh Twinkle Edition and comes in a lilac bottle with the same signature lid with a sparkly gold and soft yellow flowers. The fragrance itself is very sweet and powdery, much like the original and in all honest I can’t hugely tell the difference between this and the original (other than the bottle of course) but for me, that’s why I like it. Where other limited versions have been different and maybe not as appealing as the original to me – this one to me is almost identical and smells as lovely as Marc Jacobs Daisy Eau So Fresh original. I’m sure a more professional nose might be able to tell me the difference, having looked up the key notes as described by others (usually I’m pretty good at picking these out myself but for this I struggled!). The difference is fairly subtle – Twinkle has a base of cassis and cream where the original is cedar, musk and plum. What I would say is that if you like Marc Jacobs Daisy Eau So Fresh original then Marc Jacobs Daisy Eau So Fresh Twinkle Edition is worth picking up – if you have a full bottle of the original then maybe hold off and just re-stock when it runs out. But this is a lovely version of it and the bottle is very pretty. 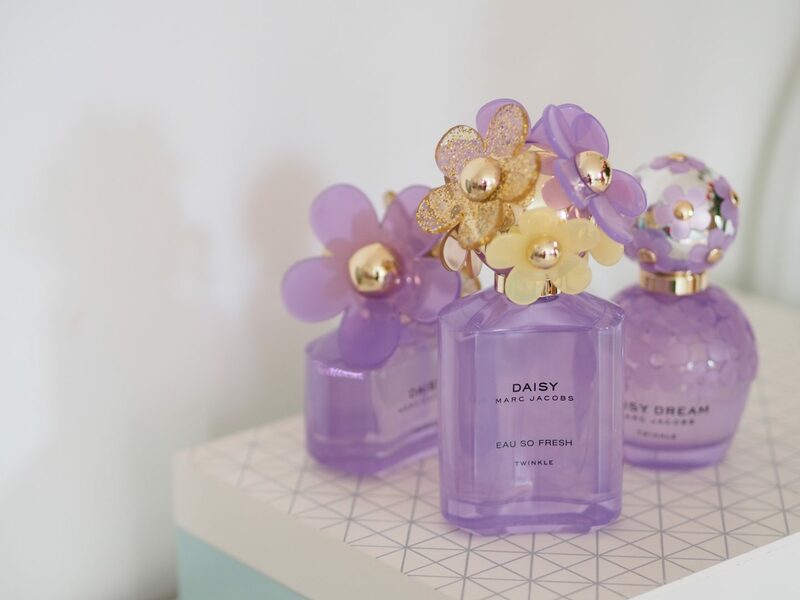 I’ve shot the images of it alongside the other two fragrances too (Daisy Dream and Daisy) all housed in the pretty lilac shade bottles but with their signature style just a new twist on the colour.